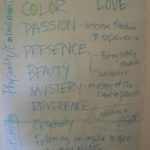 In a class I taught last fall, I posed the question, “What inspires you?” The following is what the students came up with. I’ve had it taped to my office wall ever since. In my opinion, inspiration is what life is all about. Lucky for us, it comes in many forms.